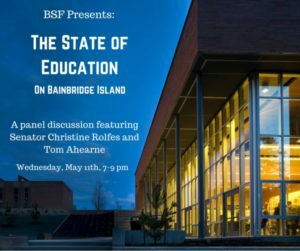 On Wednesday May 11, the Bainbridge Schools Foundation will host a panel discussion on the topic of “The State of Education on Bainbridge Island” from 7- 9pm at IslandWood. 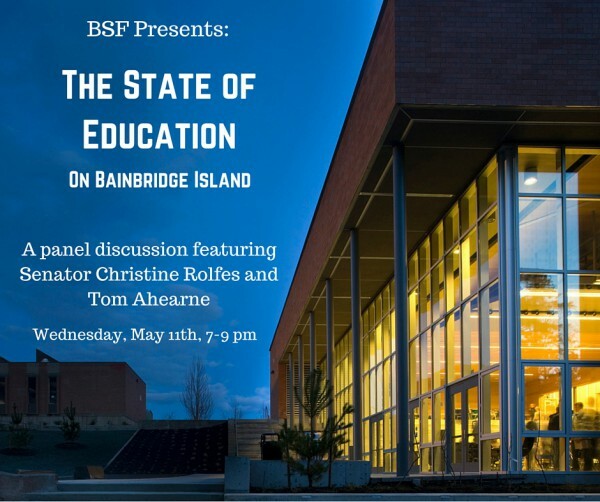 Panelists, including Senator Christine Rolfes, Tom Ahearne, and other local experts, will address the impact of such issues as the funding challenges in Washington and the teacher shortage on the Bainbridge Island School District. 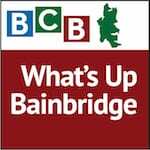 In this podcast, BCB host Christina Hulet talks with Bainbridge Schools Foundation (BSF) Executive Director Mairead Shutt about the fundraising campaign being launched with this event, and why it’s important to raise additional private dollars to supplement the public financing of our school system. BSF’s campaign, entitled “Empower Teachers and Inspire Students,” is intended to raise $833,000 to support teachers with professional development, grants and more. Listen here to learn more about this year’s campaign, about the educational and community building role of the foundation, and about some of the unique programs that BSF has funded in the past. Credits: BCB host: Christina Hulet; audio tech and editor: Chris Walker; publisher: Diane Walker.